The comic book hooked me, but I already knew the character. The Shadow debuted when my parents’ generation were children. I don’t know that most were familiar with anything beyond the radio show, but that was clearly enough for the laugh and the saying to enter the general parlance for decades. Gibson was the primary contributor to the pulp magazine during its heyday- a contribution that remains the stuff of legend. My early interest in writing and genre fiction allowed me to hear whispers about the phenomenal output of this legendary writer. 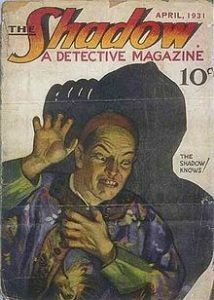 The Shadow magazine appeared twice a month. Each issue contained a full-length novel in addition to other content. Under the house pseudonym of Maxwell Grant, Gibson wrote the vast, vast majority of those novels- official count is 283. That’s 150,000 words every month for almost two decades (in addition to other work which he did, in fact, pursue). That comes out to 10 or more double-spaced pages, by my estimate, every single day without a break. that gives a would-be writer pause. I’m pretty sure that those collections of twenty or more volumes of Complete Works of so-and-so, which weigh down the upper shelves of bookstores, probably indicate similar output. Even so, Gibson’s commitment to the repeating deadline can be unnerving. Perhaps you’ve talked with a budding artist and made some comment that you considered innocuous. You watch as their expression contorts into a cross between a puddle and a terrified deer. Perhaps you’ve been the budding artist. It is hard to put your art out there in public. It is impossible to avoid the claustrophobic weight of all the artists who came before you. So, how do you think about Walter Gibson? Well, paralysis and giving up is always an option. Of course, his path is not your path. That’s why you wanted to be an artist, wasn’t it? To make your own path? Then there is the tearing him down option. Gibson must have turned out a lot of garbage. We can call that the R.L. Stine conundrum. This does require reading what the person wrote. Neither Stine nor Gibson ever claimed to be Dostoevsky, but they produced perfectly readable, enjoyable work. More than that, Gibson built a universe that maintains interest decades later. If I write anything that remains alive thirty years after my death, then “Yay!” for me. In the end, Gibson is the hard lesson that asks about commitment. I don’t believe that the answer is so black and white that dedication is only demonstrated by word count. On the other hand, that number has to be greater than zero. You’ve Got to Check This Out is a blog series about music, words, and all sorts of artistic matters. It started with an explanation. 141 more to go.